Sir Highness aka Sir was purchased as a weanling from Cheryl and Eric Johnson's Hidden Acres Farm in Adrian Michigan. He is by Sandro Hit out of Elite Mare Halleluja HA by His Highness. Sandro Hit was the 6 Year Old Dressage Horse World Champion and winner of the German Federal Championships at Warendorf, In 2011 Sandro Hit was the Leading Dressage Sire of the US. At the 2016 Rio Olympic Games two of Sandro Hit's sons were medalists. Dorothee Schnieder's Showtime FRH was a member of Germany's Gold Medal winning Dressage Team and Chris Burton's Santano was on Australia's Bronze Medal winning Eventing team, winning the individual dressage and going into the showjumping after cross country individually in first place. Currently Sandro Hit is ranked 3rd in the World Rankings for Dressage Sires, the WBFSH. Sandro Hit is also the sire of the mare Poetin, the Bundeschampion 3year old in 2000 and the 2003 Young Dressage Horse 6 year old World Champion. Poetin sold for a record 2.5 million Euros at the 2003 PSI Auction. Sir's dam, Halleluja, is a 7th generation Elite Mare. She was Champion Filly at her AHS Inspection and Champion Top Scoring Mare at her Mare Performance Test. Sir has beautiful conformation, having been characterized as a "model' by Jennie Loriston-Clarke, who is a very experienced judge of conformation competitions in Great Britain. He's a lovely mover, easy to sit, with great rhythm. He shows talent and inclination for jumping, having jumped out of his pasture twice! 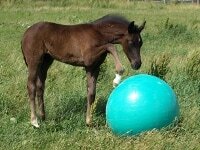 Below are pictures of Sir as a youngster from his breeders at Hidden Acres Hanoverians in Michigan.